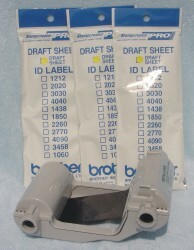 A Draft Set consists of one toner ribbon, 150 draft sheets and nine cleaning sheets. We recommend that you use the cleaning sheets after 50 stamps have been produced, more often if necessary. You can check the counter on your SC-2000 machine to see if it is time to order a Draft Set or time to use cleaning sheets. Press the "mode" button on the top panel three times. The display will say "reset counter." Then press "set." You'll see how many stamps your machine has produced. Press "set" again to clear the display.